Want a single stem, small bouquet or large bouquet? 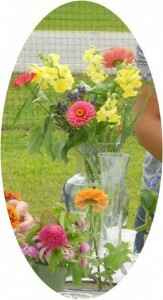 Our Flower Field offers beautiful colorful flowers for cutting. Price is by the pound. Are you planning a wedding or special event this summer and need flowers? We offer a wide array of colorful annuals and perennials. You cut-your-own or we will cut them for you. You make your own bouquets or we can make them for you. Price is by the pound. Additional cost for us to cut and /or to make the bouquets. For special occasions where you would like flowers on days we are closed, the flower field will be open by appointment. We also open early by appointment for cutting flowers for special events to ensure flowers are at their peak condition. Call us at 860-786-7486 or email us at info@raspberryknoll.com. We also have dried flowers for beautiful long lasting bouquets.